Custer started from the pole and finished second, earning nine bonus points. Led the first 14 laps before being passed by the 2009 NASCAR Xfinity Series champion and 92-time race winner, Kyle Busch. Shortly after being passed, Custer radioed to crew chief Jeff Meendering that his No. 00 Haas Automation Ford Mustang was getting tight. At the end of the stage, Custer pitted for four tires and fuel, with a slight tire pressure adjustment. Custer started third and finished third, earning eight bonus points. Ty Majeski overtook Custer on pit road, but Custer earned the spot back on the restart, passing Majeski off turn two of the 1.5-mile oval. Custer radioed on lap 63 that his Haas Automation Ford was getting tight again. John Hunter Nemechek made the pass for second on lap 72, dropping Custer to third place. At the end of the stage, Custer pitted for four tires and fuel, with another tire pressure adjustment and a right-rear wedge adjustment. Custer started second, finished fifth. Dueled for the lead with Busch at the beginning of stage before settling into second place on the ensuing lap. Stayed out during back-to-back caution periods from laps 101-103 and laps 105-108. Remained in second place for both restarts. Custer said he was loose at the onset of lap-109 restart. Dropped to fourth behind Busch, Christopher Bell and Daniel Hemric. When the caution flag waved again on lap 133, Custer was in fifth-place, having lost fourth to John Hunter Nemechek. “Terrible at the start of the run and loose on entry, especially,” said Custer during this caution period. Custer took advantage of the caution and pitted on lap 134 for four tires and fuel with a left-rear wedge adjustment. Two more cautions for eight laps slowed the final 52 laps, but Custer stayed out each time to hold onto his track position. During the final, lap-167 restart, Custer was shuffled from fourth to sixth, but he rallied back to reclaim fifth from Ryan Reed. In the final three laps, Custer waged a spirited battle against Justin Allgaier for fourth, with the duo running side-by-side on the penultimate lap before Allgaier was finally able pull ahead. 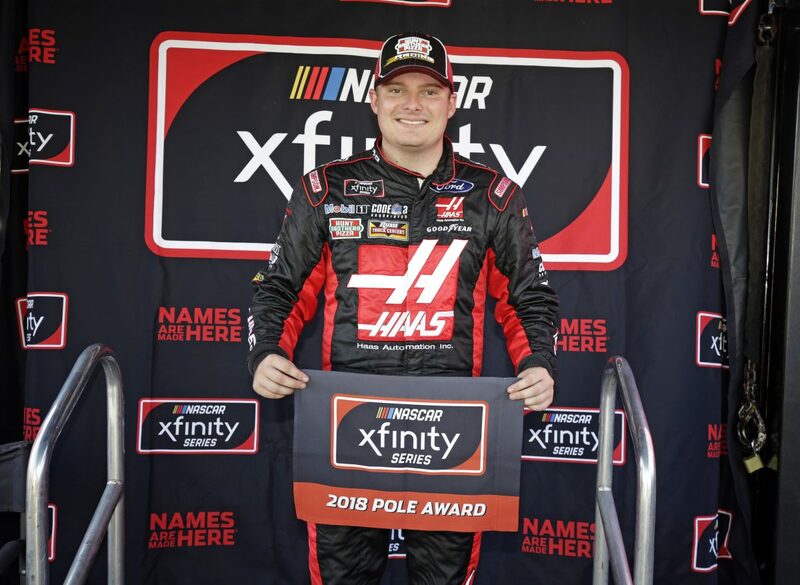 Custer’s pole was the fourth in the NASCAR Xfinity Series for Stewart-Haas Racing with Biagi-DenBeste. The fifth-place finish was Custer’s seventh top-five of the season and his second at Kentucky. Custer totaled 17 bonus points in the Alsco 300 at Kentucky. Custer was the highest finishing Ford driver. There were seven caution periods totaling 32 laps. Eighteen of the 40 drivers in the Alsco 300 finished on the lead lap. Bell won the Alsco 300 to score his third career Xfinity Series victory, his second of the season and first at Kentucky. His margin of victory over second-place Hemric was .848 of a second.